Rachel Goldman writes mysteries in which Duffy Madison, consultant to the county prosecutor’s office, helps find missing persons. Rachel is busy finishing up her next book, when a man calls out of the blue asking for help in a missing persons case. The caller's name? 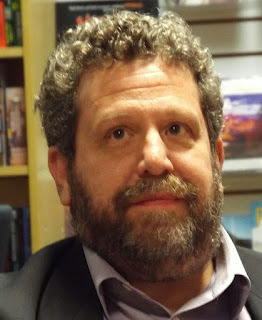 Duffy Madison. Is this real or has she lost her mind? She doesn't have much time to find out because a serial killer is on the loose, kidnapping and murdering mystery authors. And Rachel may just be the next target. Of course, Copperman being Jeff Copperman, this guest blog isn't about WRITTEN OFF. Instead, it's a meditation on... well, you'll see. The recent post from Julia’s youngest (which I thought was touching and adorable and smart and insightful and other glowing adjectives I don’t often use) got me to thinking. I once interviewed my own youngest on the trials and tribulations of growing up with a midlist author and some of the answers surprised me. Julia’s and Youngest’s experience is different of course, but the idea of having a parent whose occupation is different resonated for me. My mother was, until I was almost ready for college, what would now be called a stay-at-home mom. As a role model, this came in somewhat handy when I was the work-at-home dad (some people called me a stay-at-home dad or even worse, “Mr. Mom”), but my role model for work was my father, and he didn’t have that unusual a job at all. 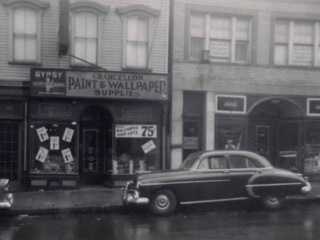 My father owned a store that sold paint and wallpaper in Newark, NJ. He was out of the house in time to open the store at six in the morning and stayed there until six in the evening, and his only day off was Sunday. He made sure that the hours he worked didn’t make my brother and me feel like he was a visitor. He was our dad the second he walked in that door and even though he had to go to sleep early for the next day, he made sure we were the center of his universe. Occasionally one or the other of us (whichever, I’m sure, had been driving my mother crazy more that week) would be told he would be accompanying my father to his business that Saturday to “help in the store.” I don’t know about my brother, but I was definitely not that much help. Dad just liked to have us around and I loved seeing his world. We’d get up at the crack of dawn (pretty much literally) and head down to my grandparents’ house, which happened to be next door, for breakfast. This was a treat since my grandparents were among the most loving and amiable people I knew, and even though they were always within walking distance, it was a rarity for one of the grandchildren to have them both to himself. Much attention was lavished. Then it was off to Newark and West Market Street where the painters would gather in the early morning to stock up for the day’s work and mostly to hang around and joke with each other. I was too young to join in but the men (they were all men) would notice the little (and I mean that literally) boy in the room, clean up their acts and play to the audience. They made me feel like part of the club. When the 1967 riots flared in Newark, my father went to his store because that’s what he did. But when he saw the violence headed in his direction he closed up and came home. The next day he found his store untouched on a block of devastation. Locals had taken bars of soap and written, “SOUL BROTHER” on the plate glass window at the front. But the area was getting difficult for the business and the new University of Medicine and Dentistry of New Jersey needed some space for a parking lot. My father sold the building and moved the store closer to where we lived. “Helping out in the store” became something I could walk to, so I did it after school. I don’t remember anything about the transaction, but I thought it went okay. When the woman walked out again I returned to the “office” in the back (it was a desk and a chair). I didn’t say a word. So I didn’t. The man knew his business. 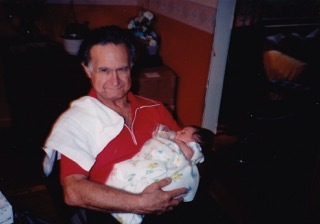 That didn’t have anything to do with WRITTEN OFF, the book of mine that is being published this week, in which a mystery author is confronted with a living version of her protagonist and pulled into a missing person investigation, but I just wanted to tell you about my dad. After all, I’m a Youngest, myself. What a lovely, inspiring tribute to your dad. It’s wonderful to have such warm memories of family and of growing up. “Written Off” sounds like lots of fun; i'm looking forward to reading it . . . .
Great memories about your dad. 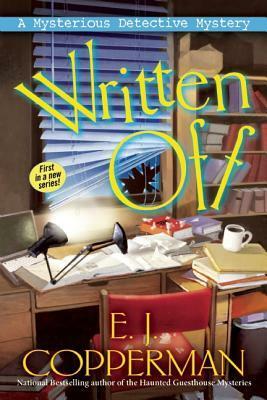 I have enjoyed your other series, and I am looking forward to reading "Written Off"! Nothing wrong with writing about your lovely dad, EJ/JEff, and what a generous giveaway offer. My father was a high school social studies teacher (and, like you, one of my favorite treats was going alone with Daddy to school on a Saturday to sniff mimeo fluid and "help out"). He did lots of writing for his work, and for his master's degree, and when I moved away he would type long (I mean, like ten pages) single-spaced letters to catch me up on news. He would have been SO proud of my late-in-life writing career. This is so touching and charming and wonderful and loving and a whole lot of other words I hardly ever use. You are a treasure --a complete complete treasure. Thank you so much for sharing your thoughts and your family photos--a lovely way to start off my day. So much joy in those photos and love in your words. 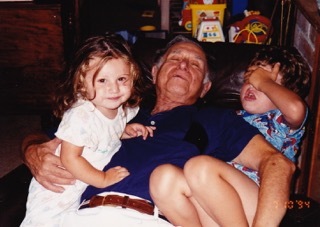 I think we have a photo of my dad with each of his grandsons--held in the crook of one arm, said child's face on top of the world. 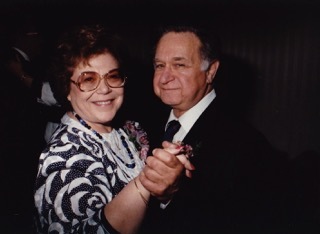 One thing my dad taught me about work--that if you can find a way to understand a person, you can get along with anyone--no matter how difficult or different. I have read almost all of your other books and am trying to get caught up on the ones I don't already own. I've enjoyed them all! Last night I downloaded Written Off for my Kindle, I first learned of your new series from one of your Dead Guy posts. By fhe way, my dad co-owned a paint and wallpaper store! Thanks to everyone who's commenting--I hope you all win (you won't--we only have the one gift certificate)! Hank, you're a joy all by yourself, and to answer your question, any bookstore that wants signed copies can certainly have one. I'll be signing at the Booktrader of Hamilton (because I'm jumping on the Hamilton bandwagon) in Hamilton, NJ tonight at 7:30 (EST), so anyone who wants one and lives within driving distance can have one! What marvelous memories. Thanks for sharing them. Nice to meet you E.J. Copperman. I haven't read your books yet but will certainly add them to my TBR list. What a great story about your dad. Thank you. My father was a first generation American, and he spoke only German until he started to school. He was the younger son, and he was chosen to be the one the family educated, sent from a poor dirt farm in Kansas to boarding school, university and then Lutheran seminary. The latter didn't take. He wanted to teach. He instilled the love of reading not only in me but in his students, first in mid-west high schools and later in university. My favorite story is of him sitting at his desk as the pupils filed in, Kansas farm kids. Good hardworking stock, but the only book in most of their homes was a Bible. My dad would be reading. As the class settled, he would start to read aloud, chosing a very exciting few paragraphs, and then stopping at the cliffhanger moment. After class there would be a run on the library for that book. He said it worked every time, and it gave him great pleasure knowing that at least one or two more of his students would be reading the Leatherstocking Tales that night. OMG, Jeff there's a memoir in this. Or a play. Or something (a la Brighton Beach Memoirs)... He sounds like a great guy. So what was it about the woman customer, do you think? I learned how to take breaks from work from my dad. He and my mom were a screenwriters and he'd leave her to type up their notes in the afternoon while he went to play tennis. What wonderful memories of your family. My dad worked for Humble Oil & Refining, later to be Exxon. When I was in elementary school I'd ride downtown with him Saturday mornings. He'd drop me off at the library. When I was done I'd walk to his office where he was catching up on things. He was a CPA. I don't remember getting to see his office when the new Exxon building was finished. However, in New Orleans where he later worked for a subsidiary I was in high school and could pop in and out whenever. I might ride downtown with him on the weekend and do a little shopping until he was ready to leave. He frequently stopped at the bakery at DH Holmes to get some goodies to take home. Happy memories! What an interesting story, Jeff. As a child, my favorite memories were of going rock hounding in the high deserts of southern California and soaking (naked) in the mineral-laden waters of Tecopa hot springs. Since my parents both worked civil service at Edwards Air Force Base, there weren't any "go to work with your parent" days. Then I met the man who became my step-dad. He built dry washers, for mining gold in the Arizona gold country. That was his "day" job, supporting his writing, which paid even less in the late 50's early 60's. He taught me how to change tires, change the oil, and replace a head gasket on an engine. He also encouraged me to write. Although I never worked with him in his shop, I developed a love for power tools and building things. My ex used to say I was the only woman he knew who wanted power tools for gifts, rather than jewelry. So yes, I love love love hardware stores! Your book sounds fascinating! What a premise. My dad worked as a New York State civil servant. He hated his job - but he worked it for 19 years because he had four kids and he needed to do his share to provide for his family. Eventually, the job broke his spirit and he wound up with depression issues, got fired, his marriage was rocky, etc. But he survived. What I learned from him is sometimes you need to stick with an uninspiring job because you need the steady income to make sure your family is secure. But don't stick with it so long that it becomes soul-sucking because mere money isn't worth happiness in the home. Hi Jeff! Loved the memoir, and the book sounds terrific. My dad grew up on a cotton farm in East Texas, and only finished 8th grade. 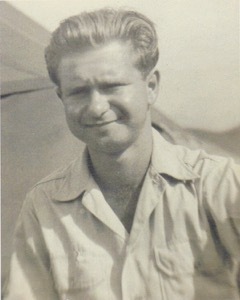 He moved to Dallas, where he worked three jobs during the Depression. He eventually started his own business, selling popcorn to movie theaters. I have some great photos of his bags--labeled The Popcorn Man--being unloaded from an early American Airlines jet. From there he became a manufacturer's rep, selling popcorn and other theater concessions. My mom worked with him and so, eventually, did I. It was a fun childhood. We traveled a lot (on business!) and every year went to NATO conventions. (That's National Association of Theater Owners, in case you were wondering.) My dad loved his job. He taught me that all business was really about people and how you treated them. But I think more than anything he would have liked to have been a writer. He was incredibly proud of me. I really do recommend WRITTEN OFF, and not just because Jeff has promised to pay for dinner next time we visit New Jersey. Hi Jeff, your guest blog post really brightened my day. Thank you! I haven't read your books, but I will definitely check out both series. My dad was an aerospace engineer who died when I was 8 years old. In the year before he died, he was going back to school and getting his PhD and also taking some oil painting classes - all while working full time. I think I took after him by going back to school myself while working full time to get my MBA in Information Systems. I've also wanted to tap into my desire to paint as well, but I haven't done so yet. It still amazes me, even though I've been a regular here for a while now, how quickly my TBR pile grows from this blog. I already had the Asperger's series on my short list, and now I am delighted to add the Haunted Guesthouse series and this new Mysterious Detective series, too. Both premises bring an excited smile to my face, a haunted place and a mystery writer involved in real life murder. I just love the set-up, so on my short list they go. E.J., you are one busy writer, and I'm guessing you like it that way. Your description of growing up with an amazing father was so touching, E.J. My father has always been a source of admiration for me, too, even though I don't feel that we were emotionally that close. Part of the emotional distance was due to him being 52 years old when I was born, so he really did very well considering that. Like your father, Debs, my father lived on a farm and only finished 8th grade, something that played into his pride in his children all earning college degrees and beyond. But, that was what was normal then, and he went on to be quite a success. He started out in insurance and then changed to real estate, where he was a visionary of subdivisions in our county. He developed the first subdivision in that county and, as a real estate broker of his own business, provided a very comfortable life for his family. Now, I do have the memory of visiting his office quite often. Ours was a small town, and Daddy's office was in one of the two major banks. I would check in with him as I explored downtown, usually with my friend Jimmy, whose mother had a shop downtown, too. In high school, before I drove, I would stop in the office for a ride home sometimes, especially if I'd stayed late after school for an activity. 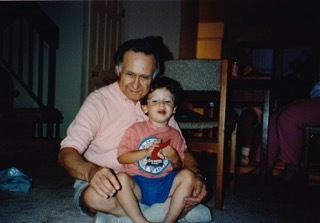 Good memories of having my father close by during my day. Thanks for stirring those up, E.J. Love the Haunted Guesthouse series and now I'm longing for WRITTEN OFF! What great memories and a lovely tribute to your Dad. He sounds like an amazing man. Although my father didn't own his own business, he worked in a factory and on weekends he did odd jobs for anyone who needed something done. I cherish the memories of my father since I was the last child and had more of his time because of this. Seeing him build houses, doing the wiring and the next minute tuning up a car, provided me with the knowledge although he didn't complete high school that my father had so much knowledge that he gathered on his own time and pace. Thank you for sharing your memories with us and for allowing us to remember the memories of our own fathers. I love The Haunted Guesthouse series,I know I will love this new series as well.My dad has always worked 2 jobs to support his family,and still took us camping uo North.Took me and my mother to California to visit relatives.